When it comes to making money, people often look for easy options or get rich quick schemes. That is not what this post is about. It is about making money from home (or anywhere really) yes, but it is about starting an online business that has the potential to change your life. That is why you should consider starting an Etsy shop. If you like to create things, then starting an Etsy shop is a good way to make some money doing something you enjoy. If what you create can be sold as a digital download (such as photos or digital designs), the selling process is even easier, because you don’t have to worry about shipping. In today’s post, I am going to talk about the pros and cons to starting an Etsy shop. Starting an Etsy shop takes almost no time at all. You can create a free account, create your shop and list items within a few minutes. Just be sure to chose a shop name that you really love, because you can’t change it later. You don’t have to pay for anything when you create your shop. You do have to pay 20 cents for each item you list. Overall, there are no monthly fees for hosting a store on Etsy, which is great if you are low on cash. If you want to try out an Etsy shop and get 40 free listings, click here. Etsy has a ton of built in support and fans to bring views and sales to your shop. People have heard of Etsy and know that it is a great place to shop for handmade items. This means that you won’t have to work as hard to get people to see your shop. It takes time to build your shop, fill it with listings and get paying customers. When you do get customers to your shop, you have to work even harder to push out orders. If you sell digital products, you won’t have to ship your items, but you will have to help customers who have questions about downloading and using your products. While it costs almost nothing to list an item on Etsy, you do have to pay for any supplies or programs you might need to create your products. You can’t start selling knitted scarves if you don’t have yarn. When you do sell an item, Etsy will take a small cut of the profits, so you have to account for that in your prices. Since Etsy is a common place to sell products, that means you will find a ton of competition on there. You will have to find a way to make your products stand out from the competition. It is possible to have a lot of success on Etsy, but you can’t just set up shop and expect to make money. Luckily, Etsy has a lot of information to help you learn how to be successful. They have a whole guide dedicated to selling on Etsy, you can join Etsy teams to get advice and share your work and you can subscribe to the Etsy Success newsletter. Etsy can be a great way to sell stuff online and make money, but you have to make it work for you. Etsy is a great place to get started in the world of selling stuff online. You can even sell services on Etsy, too. I have yet to have a ton of success on there, but I haven’t been as active as I should be. When I start to have some success, I plan to write a post about successful selling on Etsy. An Etsy shop is a great way to start a business from home. You don’t have to pay rent on a store front, listings are cheap or even free and the transaction fees are small. If you want to work from home, an Etsy shop is a great income stream to have. If you want to see if an Etsy shop is for you completely free, you can use my link to get forty (40) free listings! Those are some pros and cons to starting an Etsy shop. 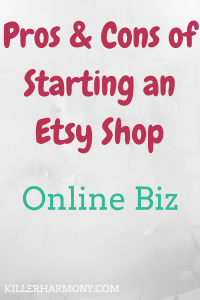 If an online business is something that interests you, Etsy is a great way to test it out. Have you started an Etsy shop? Did I miss any pros or cons? Let me know in the comments or on Twitter (@HannahHaefele)!